Dashlane integrates with Safari and Chrome so that you can autologin and autofill forms as you use your regular iPhone and iPad browsers. In order for Dashlane to work in these browsers, note that you must have already enabled Dashlane to your list of Activities. If you have not yet done so, please refer to this article for more information: How to add Dashlane in your browsers and apps. Why Dashlane does not autofill my information on a particular website? Then, look for the Dashlane icon in the bottom row and tap on it. 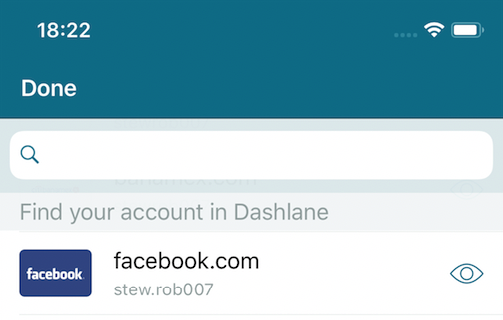 Now, authenticate to Dashlane via your usual unlock method, and choose the credential you would like to log in with. We do our best to make Dashlane work efficiently on all websites. However, you might come across a website where autofill actions could not be completed. If so, you want to make sure the website URL saved in your Dashlane credential for this site matches the one on your browser. If the URLs are identical and you are still not able to get Dashlane to work properly on that website, you can contact our support and report this website in your email. Please make sure to provide the full link to the website that is failing to work.